The first of the modern jets to be designed specifically for photo-reconnaissance, the Thunderflash was the first reconnaissance airplane equipped with a combination of standard aerial cameras and dicing camera for close-up photos of individual targets. It was also the first fighter-type aircraft to be equipped with the Tri-Metrogon camera which could take horizon-to-horizon pictures. Unlike the Thunderstreak, the Thunderflash had its air-intake ducts located in the wing roots rather than the nose, which was elongated and enclosed to permit installation of a sweeping variety of camera and electronic equipment. It was the first reconnaissance fighter to have a camera control system and a viewfinder for the pilot, who also acted as the cameraman. The aircraft was first tested in February, 1952, and 715 of the aircraft were produced. As you can perhaps tell from the image, this isn't exactly a new kit. 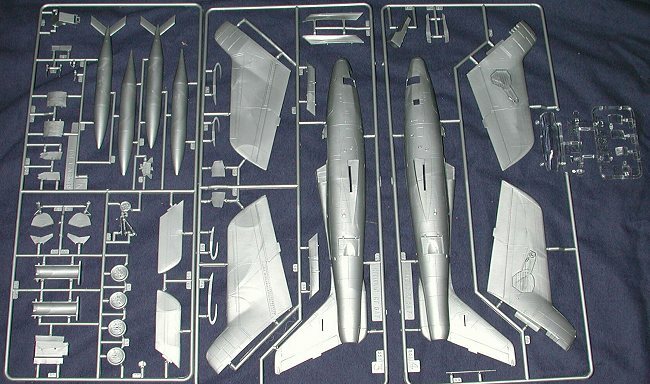 However, it does have the distinction of being the only RF-84F available in 1/48 at this time. 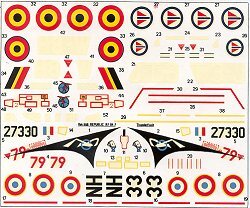 Why it came from Heller is easy to see once you realize that back when Heller was a major force in the hobby, it produced many kits of aircraft that were used by the French AF, and the Thunderflash was one of them. It is of the raised panel line variety and though this may turn off some modelers, the rest of us realize that this is just as viable a way to produce a kit as any other and will cheerfully build the kit despite this seeming anachronism. There was no flash on this kit nor were there any real problems with sink areas as the only ones I found were on the nose gear doors. One will, however, have to deal with ejector pin marks on some of the landing gear parts. They are mercifully absent from much of the kit, not always the case with these older engineered kit. Though the interior is pretty well detailed (at least for the time) with raised detailing, the canopy is only molded in the closed position, so any additional cockpit work will not be seen that well. It would also have been nice to have some cameras to put behind those nice, clear, camera windows. The instructions are basically in French with an addendum sheet in English, Spanish and German. Fortunately, the exploded views are pretty self-explanatory so no real problems there. Colors given are all Heller and the translation is only for generic names. The experienced modeler should have no trouble in that respect. Decals are for three planes. The box art plane is in bare metal and from ER 2/33 'Savoie' and in what appears to be the additional markings of a NATO photo recce competition. A Belgian RF-84F from 42 Squadron is also included and it is in NATO green/grey over aluminum, though this underside color could have been a darker blue. A similar scheme with the lower color in aluminum is provided for Norway's 717 Sq. The decals themselves have yellowed, but as I have mentioned before, I think Heller decals were made yellowed. There may be some aftermarket sheets for NATO planes available. I know there are some for USAF and ANG versions as I used one when I built my RF-84F as an RF-84K. Heller decals are very flat, and though they generally stick OK, they can use some help from a strong setting solution. Other than the fact that this is it in terms of 1/48 RF-84Fs, it really isn't all that bad a kit. I've seen it built up by modelers with more talent than I and it does make for a stunning model. It is one that I can recommend to all but the newest modeler.